Most people love surprises.There are a few who consider surprises a great inconvenience and a foolish thing because it makes them deviate from their pre-planned routine which they adhere to, tighter than a lycra skirt worn by a teen at a first date to a disco. Almost all children do. Love surprises that is, not the tight skirt. A friend of mine used to tell her husband that he has to bring a surprise gift for her when he travelled. Sometimes she would even specify what the surprise gift should be . :-) He always obliged. My daughter is the master of surprises. Almost all days she has a surprise for me when she comes home from school. I wait eagerly for the time that she comes out from her class in Pavlovian anticipation of a gift from her. She never disappoints. She usually will have something that she has made in the class. Her eyes shining and a wide smile spread across her face, she will say " Ma--guess that I made today?" Each day I think of new things to 'guess' which can be as off track as possible, ranging from flying saucers to mooli paranthas to high heel shoes. "Ma--how can I make that? Now guess really," she will say. I will pretend to think really hard and then I say that I give up. She will usually give me a drawing or a model that she made in class. "Ma--it is just for you," she will say with all sincerity and hug me tight. It gives me so much joy to see her face lit up. She will then anxiously ask me if I like it. Yesterday she had a slightly different surprise for me. 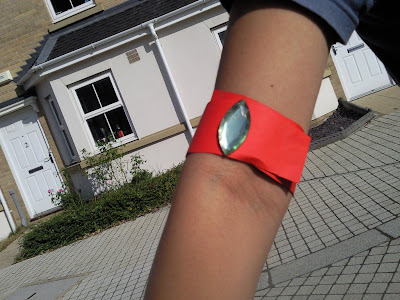 It was a paper bracelet with a 'gem'. There was only one 'gem' in the box from which the children had to choose the beads and accessories, that they could use. Another girl had chosen the gem but my daughter told her that she very badly wanted it to make something very beautiful for her mother. My daughter says that it was the best day in her life because the other girl agreed to let her have the 'gem'. She made a bracelet for me, which goes around my arm, not my wrist. She was delighted to see me wearing it (see photo).This was one gift she did not want me to share with her brother and father. Yesterday I too had a surprise for her. A few weeks back, she had taken part in a competition at the Children's library where she had answered a few questions about BFG which is a Roald Dahl book. The prize was tickets to the play which is being staged in an art deco theatre, one of the finest in UK, that can seat 1300 and it stages a high quality mix of comedy, drama, dance, operas and musical shows. The library called me to tell me that she had won four tickets! The show is today at 7.00. p.m. I simply love suprises. What about you? A fellow blogger, now also a friend is taking part in a contest for 'Chief blogger'. His writing is superb as many of you already know (Don't take my word for it. Click here for proof) There are only four days left for voting. It would take only two minutes of your time. Please vote for him by clicking here. I do want him to win as he deserves it totally . Good luck Prashant! Such a beautiful bracelet made with love. I am with you in this matter of surprises. I simp0ly love them. But usually it is moi surprising the rest rather than being surprised myself. But I guess, some are born surprise-givers and others surprise-takers! ;) As for routine, I dont stick to one at all! Lovely bracelet that was! !Again, an 'anythng is worth is moment!'. Hope the four of you had a grand time! !Pass my congrats to the sweet girl for her win!! Shail: You're a woman after my own heart! Yes--routines are boring! I love surprises as well! Though I do like getting them, I love giving them to people and watching their faces light up when they realize what is going on! I hope you have a great time at the play tonight, it sounds like a good surprise indeed :). May you have as many pleasant surprises as can be had without making them a routine :). Purvi is a real champ :). Tahe-dil se shukriya for the vote-request. I am your slave forever :). Surprise..hmmm.. I dont know whether to classify it really as a surprise, but, hey, that was pretty surprising for me today when I hit the office. My current client, is almost on dire straits with their finance and they thought it would be better to scrap the project ! I did not know how to say it to the team(and ofcourse convince myself to an extent) which had put quite a lot of hard effort in trying to learn things. I just started off with a saying "Nothing is permanent and only change is permanent...". Well, they got the message. Everyone loves suprises.... and the most comes, when someone close gives that.... and your totally had no idea about it!! Really there exist people who get annoyed by surprises?Yikes! I have been reading your blog regularly from the beginning of the year and so far never left a comment (just lazy not to do so). Your writing is so good that I am compelled to do so now. You are a wonderful writer. What I really like about your writing is both content and style - you take simple events/moments and write about them so stylishly that it leaves the reader thinking...wow I can relate to that as well. So good job and continue writing. With respect to this article on surprises - its a wonderful thought. Sometimes in the "routineness" of life I start hating surprises as it puts other plans of mine on hold. However I love your take on it - ya unexpected events do make life interesting. Wonderful and thought provoking post to me. Loved the writing as always.. I love surprises and forever tell my hubby to give me surprise. I once went to India alone [only my parents and in-laws were aware of this] and surprised my cousin who was getting married. She wanted me to be there for her wedding and I told her I could not make it. Everyone at the wedding were surprised to see me there..
My hubby says that it is difficult for him to give me surprise as I come to know all his actions he he he..
Oh this romantic man - roses as a surprise, dinner as a surprise - lucky you !! ohh lovely post.. could imagine how you must have felt (feel actually since Purvi surprises u regularly).. i totally loved the bracelet.. Please convey my congratualtions to her for having won those tickets.. you must be a real proud mammma. I am a huge fan of surprises.. I love them. And not surprisingly, yet nothing routine, your post was once again a super blend of love, emotions and sheer poetic writing. The bracelet is beautiful and I love the shape of the gem! Please give Purvi a hug from me. Daughters are really special!!! cute is all I can say..
AJCL: I feel good when she makes pictures--proud--no, not really! Happy--yes! Meira: heh heh.Yeah--you train them right they will behave through out the coming years :P :D Play was indeed awesome. Sanjini: Honoured that my writing prompted you to finally break your silence :) Welcome to my blog and happy that you enjoy it! Rohit: oh yes. Very true! Nandgopan: I guess there can be pleasant surprises and not so pleasant ones as well! Purvi is such a darling!!! And of course I love surprises...infact my hubby never knew what is surprise...but now even he has started giving surprises...now and then he would bring roses for me..i feel so good!! I loved the bracelet..hugs to puvi!! Seriously ur daughter reminds me so much of Nikita....though I havent heard it atleast for 2 months now[maybe coz of summer hols] but it used be usual for Nikita to get off her school bus & hold her hands behind her back & say "Mama I have a surpraaise for U" & it wd be some hand-made card or some golden beads or a 'diamond' which some friend gave her or a chocolate which she got from her classmate who celebrated a birthday. And in the same way I do the simplest of things like maybe pick a flower for her from the park or make her favourite tomato chutney or make a tent in the living room with a bedsheet & say surprise & watch their faces, they are so thrilled. That joy is so pure tht sometimes the eyes sting:-)). Savitha: Apologies! Glad you pointed it out.Actually you commented the exact same time as I replied! That is how I missed it--as later when i scrolled up I replied upto the point which had my last reply! :) Yes the play was great and will surely pass on your wishs to purvi :) Thank U! I read part 2 & 3. Great read! Who doesn't like surprises??? I simply love them. That was sweet of your daughter to make a bracelet just for you. Everyone like surprises.I like to give a surprise gift to my husband.May be its a book,cd or anything wat he likes. Congrats to Purvi on winning the tickets..